12 Berlin TV Tower Facts You May Not Have Known! They call it "that tower again" for a reason. You can see the Berlin Tower, also known as the Berliner Fernsehturm in German from anywhere in the city. Literally anywhere! While it was built to show the strength and superiority of East Germany's socialist society, the Berlin TV Tower is now an iconic symbol of Germany's capital. Standing stoic and tall at 368 metres high, it is often counted amongst the tallest buildings in Europe and makes for a great vantage point to capture unrestricted views of the city, especially during the golden hours of sunset. In the early 1960s. 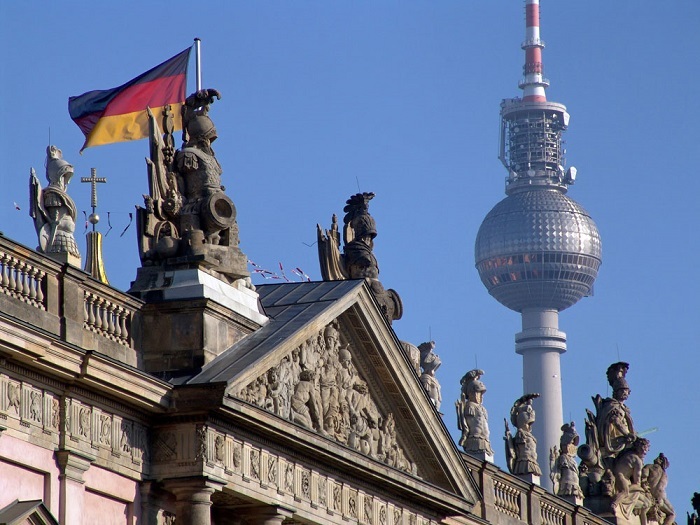 Berlin was touted to get a television tower. The German Democratic Republic planned to build this new facility primarily for the broadcast of GDR television programmes. Alexanderplatz was chosen as the location, firstly because it was in the outskirts of the city and secondly due to financial constraints. It was installed by German architect Hermann Henselmann, who invented its characteristic form and in 4 years the tower was grandly completed in 1969. Did you know, the sphere on top of the tower symbolizes the Sputnik 1, the first satellite to orbit around the Earth? The building - internally known as "Fernmeldeturm 32" - serves as a viewing tower with observation deck including a bar at a height of 203 metres, as well as a rotating restaurant. It is also a part of the World Federation of Great Towers, with other iconic towers like the Burj Khalifa, Busan Towers, Empire State Building and a lot more. If you're planning a visit to the Berlin TV Tower, here's what you can expect. Provided you have purchased your tickets online in advance, you can skip the winding long ticket lines and exchange your voucher for a pass and move on to the security lines directly. After the security line comes the elevator line where those with VIP tickets are given priority and functions on a first come first serve basis. The elevator ride in itself is quite epic as it takes just 40 seconds to reach 203 meters ie; 6 meters per second. On the ride up, you'll have an elevator attendant giving you a commentary in English and German. The ceiling of the elevator is glass which lets you watch yourself rush up the interior of the tower with great speed. 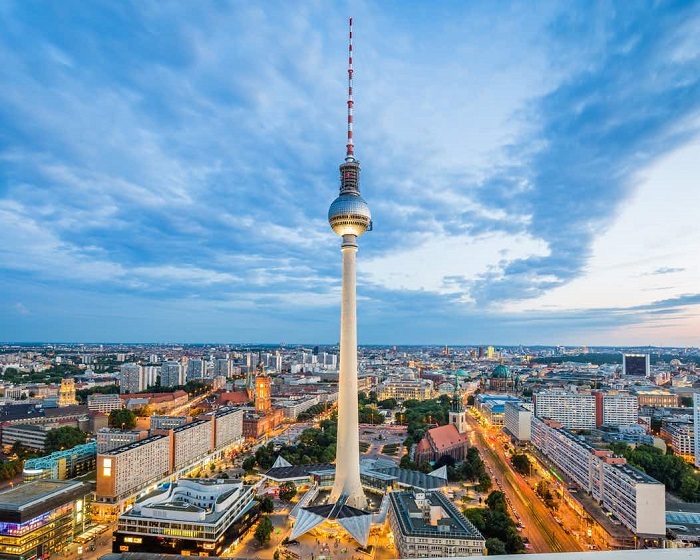 Once you step out of the elevator, you reach the Berlin TV Tower Observation deck located at a height of 203m. PS: It's at a height taller than the Eiffel Tower! Behold the entire city in front of me, with views stretching for miles and miles. From up here, you get a sense of just how big Berlin is. As you move around the panoramic Observation Deck, informative signs placed strategically around the viewing deck point out various important landmarks that can be seen below you. Don't forget to spot the famous landmarks like the Reichstag, the Berliner Dom and Tempelhofer Feld. After you've had your eye's fill of Berlin, you can choose to leave the tower or move onto the rotating restaurant for a scrumptious meal. Note, you have to make reservations for the restaurant in advance as they sell out pretty fast. It is said that the Berlin TV Tower was originally touted to be located in Muggelberge and much shorter in height. However, the height was getting in the way of the flight path of planned Schonefeld Airport. Hence it was shifted to Alexanderplatz and they increased the height as there was no reason not to! Labourers worked in 3 different shifts to finish the Fernsehturm on time. The construction took 4 years and in order to complete it by the decided date October 3, 1969 ; labourers were made to work in 3 different shifts to complete the tower. The construction cost 200 million marks and exceeded the initial cost by by a whopping four times. The Berlin TV Tower is really really heavy. The tower was built out of 7,900 cubic meters of concrete and 3,400 tons of steel. The sphere weighs 4,800 tons, the tower itself - 26,000 tons. The Fernsehturm is the tallest building in not just Berlin, but all of Germany. observation deck on the sphere located 203 meters above ground; the Berlin TV Tower is the tallest building in all of Germany. From its observation deck, you can view the landscapes of Brandenburg 42 km away. The elevators take just 38 seconds to reach atop. That's fast! There are 3 elevators in the tower; two of them for the visitors, one is for the working personnel only. These lifts takes only 40 seconds to reach 203 meters ie; 6 meters per second. There are multiple elevators so that in case of an elevator break down, the other elevator can reach the same height and evacuate people. Even if you're feeling athletic, visitors are not allowed to use the 986 steps that lead atop. Although the oscillation of the tower is hardly perceptible, the tower sways. At the top of the antenna, the movement can reach 60 cm and at the sphere about 15 cm. The frequency can be between 7 and 10 seconds. So observe carefully and you may be able to see it. As per the safety regulations, only 400 people are allowed into the sphere where the observation deck is , at a time. This includes 380 visitors and 20 staff members. If you dine at the sphere of the Berlin TV Tower, you will find yourself in a rotating restaurant which takes 30 minutes to rotate fully and get a 360 degrees view of Berlin. The sphere rotating restaurant is an absolute delight and quite popular amongst tourists and locals alike. But, due to its rotating nature, it is unsafe to have the kitchen within the premises because of which it is located on a lower floor. The food is brought up to the sphere via a special separate elevator. When the sun shines on the dome of the Berlin TV Tower, a cross shape reflects on it. The architects and atheist Communists of East Germany tried their best to remedy this with paints and chemicals, but to date the crucifix appears on a sunny day. Hence, West Berliners call this the "Pope's revenge ". Come rain, storm or shine, the tower is safe in bad weather. While many may think going to such heights during the storm is unsafe, it actually is not. In fact, the Berlin TV Tower is the best lightning rod in the city. It has special protection around the sphere that protects passersbys' from sudden avalanches. Oh yes! For all those who thought the Berlin TV Tower was just a tourist attraction this may come as a surprise. The tower is owned by Deutsche Telekom, and over 60 different radio and television programs are broadcast via the tower's antenna. Tune in to some radio channel while you're in the tower and expect the best reception you've experienced till date. The last ascent is at 11.30 p.m. Note, the Berlin TV Tower remains closed on two days every year for maintenance work. The next date when the Tower will be closed is: April 1, 2019. Please check the website for more details on the next date it will be closed. The Berlin TV Tower being one of the most popular ( the popular , in fact) attractions in Berlin, it is almost always crowded. It is best to book fast track entry tickets to avoid long queues. Make sure you keep a close eye on the weather forecast for clear skies and visit early morning when the light is soft. Mornings, around 9:00 AM sees the least queues so you can avoid paying a premium of skip the line tickets as well. Another good time of the day for visiting the Berlin TV Tower is as the sun sets across the city. While Berlin is photogenic at any time of year, whether covered in snow, filled with spring or summer sunshine, or soaked in its beautiful autumnal colours ; the golden hours of the sunset add a touch of magic that is breathtakingly beautiful. Make sure you book a slot for these hours in advance as they sell out pretty quick. The easiest and best way to reach the Berlin TV Tower is by public transport. The entrance to the Tower is directly opposite the Gontardstrasse exit of Alexanderplatz station. The Berlin TV Tower restaurant named "Restaurant Sphere" is a historic revolving restaurant, towering 207m above the city. 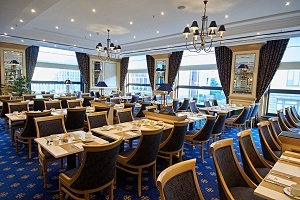 Here, you can experience Germany's highest culinary tour and indulge in a refined Berlin cuisine from morning till night. The ambience is a mixture of modern design and retro chic with a "starry sky" on the ceiling and a musical accompaniment on the piano creating a very special flair. The rotating platform also includes an unforgettable 360 ° city tour. As for the food served here, Tripadvisor displays a mixed set of reviews with some people strongly condemning the food and some who have found it worth their money. However, with a rating of 4 / 5 by over 2,311 visitors it does seem worth a try. They serve all meals - Breakfast, Lunch, Dinner, Brunch and have vegetarian and vegan options as well. Check out the menu to know more about all that they serve. Restaurant sphere also has a well stocked bar should you like to grab a drink to go with your meal. Note, there is NO dress code for the restaurant and smart casuals are welcome. Seating in the restaurant is arranged in 2 circles ; window seating (best view and more expensive) and inner circle seating ( the 2nd row of tables on inside of the window seats). Tickets for both circles are available online and advanced reservation is a must. Tickets often sell out months in advance, but should you plan in advance make sure to get the window seating. They are well worth the premium. 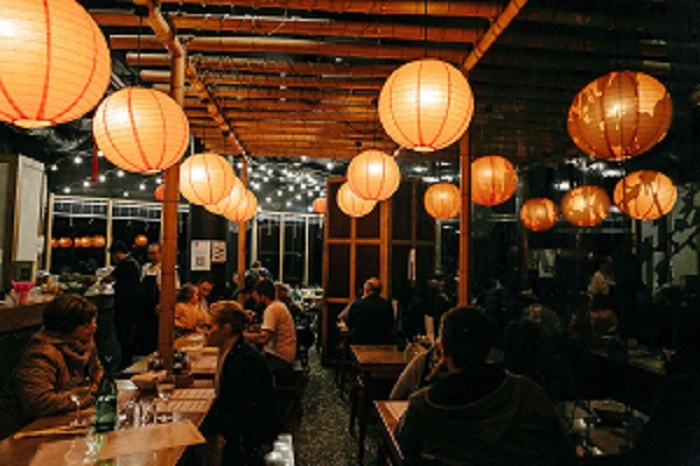 Reservations include a flat fee and the meal costs over and above the reservation fee . The cost of this ticket also includes access to the viewing platform, one floor lower than the restaurant. This may work out a little expensive, but you can opt for the Beer & Boulette if you're looking for a more economical meal. Both the lifts are not wheelchair accessible, hence those with mobility issues may not be able to go atop the Berlin TV Tower. If you're planning to buy a ticket on the spot, make sure you have a phone number with incoming SMS service. This is because you may have to wait after buying the ticket before gaining admission to the TV tower, as the capacity is limited due to 400 at a time. In this case, send an SMS with the SMS code of your ticket to telephone number +49 (0) 151 15 16 39 22. You will then receive a confirmation SMS and can leave the premises until you receive a SMS stating your slot. Approximately 30 minutes before the calculated admission time to the Berlin TV tower, you will receive the second SMS with the information when your slot is ready. You incur no additional costs in addition to your normal SMS fees. There is a free cloakroom for coats, but the TV tower recommends leaving large bags and suitcases in the lockers at Alexanderplatz station (additional cost). Pets, camera tripods and pushchairs are not allowed inside. If you've spent over and above your budget to make it to the Berlin TV Tower, why not check out other free things to do in Berlin and save a few bucks in the process? Berlin Hop on Hop Off is a great buy to save money and cover a lot of ground. After your 1-hour guided tour of the Square, you'll have the opportunity to climb the Leaning Tower. Enjoy skip-the-line entrance to Sphere, a revolving restaurant at a soaring 679 feet. Dine in the elegant atmosphere and admire incredible 360-degree views of Berlin from your table. Select the ticket with entrance to the Leaning Tower and take the opportunity to climb the tower.